TIME: The time left up to the expiry. STRIKE PRICE: The price at which you are buying or selling the option. OPTION PREMIUM: The premium of the call or put option that you intend to trade in. VOLATILITY: The assumed/implied volatility of the stock/index (underlying) as calculated based on historical data. RATE OF INTEREST: The safe rate of interest. Options Greeks correlate and analyze these sensitives and and Options Writers draw inferences from the analyses. Option Writers/Traders read the Greeks data (mainly Delta, Gamma and Theta) to enter or exit trades. b. How is it calculated? The Greeks are calculated with online tools and therefore you should not bother about calculations at this moment. It is important that you understand the concept first, and then get to the calculation. When the price of the underlying moves up by Rs 1, its Call Option premium also moves up, while its Put Option premium falls. When the underlying’s price moves up by Re 1, the Call Option premium can move up anywhere between 0 and 1. Obviously it can’t move up above 1 or go down below 0 when the price of the underlying moves up by JUST 1 buck. As per Options Greek covenants, the Delta for a call option is always POSITIVE, between 0 and 1 (or between 0 and 100) . This movement of the options premium in relation to the underlying price is referred to as the Delta (in this case for Call Options). So if the the delta for a call option is calculated by an online tool to be 0.50, it means that for that call, the premium will move up or down by 0.50 paise for every Re 1 movement in the underlying’s price. Some folks use a scale between 0 and 100, and therefore 0.50 and 50 represent the same Delta. As per Options Greek covenants, the Delta for a call option is always NEGATIVE, between -1 and 0. When the underlying’s price moves up by Re 1, the Put Option premium can fall anywhere between 0 and 1. Obviously it can’t fall more than 1, or at best it can lie static by not moving (0), when the price of the underlying goes up by a buck. This movement of the Put options premium in relation to the underlying price is referred to as the Delta (in this case for Put Options). So if the Put option premium moves down by 0.30 for every Re 1 rise in the underlying CMP, the Delta is -0.30. Some folks use a scale between 0 and 100, and therefore -0.30 and -30 represent the same Delta. AND, as explained above, the Delta can only be between -1 and 0 (or between -100 and 0) for a Put option. So we now know that the Delta for a Call Option is between 0 and 1, and between -1 and 0 for a Put Option. If you buy an in-the-money call option, the Delta will approach 1 by expiry. This is obvious, because as expiry approaches the in-the-money options premium will more or less keep pace with the underlying’s price. Conversely, the Delta for out-of-money call option will approach o by expiry. If you buy an in-the-money put option, the Delta will approach -1 by expiry. Conversely, the Delta for out-of-money put option will approach o by expiry. The delta keeps changing. On a given day the Delta for a CE can fluctuate from 0.20 to 0.70 or from 0.50 to 0.10 very quickly, depending on how volatile a stock is. Options writers use Delta to measure their risk. For example, if an Options Writer sells a CE at 0.50 Delta and it suddenly spurts to 0.90 then his risk increases. To Options Writers, the Delta also denotes the probability that an option will expire ITM. For example, if the Delta is 0.20, then there are 20% chances of that expiring in the money. Therefore, if you buy or sell naked options, you should use Delta to figure out your chance of making money. At this point, you also must combine your reading of Delta with our trade setup. If our setup gives you a bullish signal, it could mean that the Delta is likely to increase. Gamma is the rate at which Delta changes based on every Re 1 fluctuation in the underlying’s price. CEs have positive gamma (for every Re 1 rise in price the positive gamma gets added to the Delta, and vice ersa) while PEs have negative gamma(for every Re 1 rise in price the gamma gets deducted from the Delta, and vice versa). Let’s say KPIT Tech is at 285 and its 28 JUNE 290 CE is selling for Rs 9. Let’s assume its delta is 0.2 and a gamma of 0.1 or 10 percent. (Note that the calculations are done by software, and these are just assumptions). If the stock price moves up by Re 1 to 286, the delta will get adjusted from 0.20 to 0.30 (the Gamma of 0.10 gets added to the Delta for ever Re 1 buck jump in price, or deducted by 0.1 for every Re 1 fall in the price. So Gamma accelerates with a Re 1 rise in price and reverses with the same speed with every Re 1 fall in price. However, note that the Delta for a CE can move only between 0 and 1, and therefore if the underlying’s price keeps increasing or falling, the accretion to gamma will keep decreasing because the maximum limit that the Delta can hit is between 0 and 1. When the CE goes deep in the money, the Delta will equal 1 and the gamma will hit 0. Likewise (conversely) for PEs, where the Delta can only be between -1 and 0. If gamma is high for OTM CEs it means that the Delta and options premium will rise quickly with every Re 1 rise in the underlying. A bullish signal. If gamma is high for OTM PEs it means that the Delta will rise quickly with every Re 1 rise in the underlying. A bearish signal. Option writers get into action in the last week of expiry and start shorting OTM options in order to make premiums. They typically look for CEs and PEs with low Delta and low Gamma. Theta represents time decay. Options Writers love it, option buyers hate it. It tells you how much the premiums of calls and puts are expected to fall per day as the expiry draws near. In general, Theta for ATM and ITM options increases as expiry draws closer while Theta for deep OTM decreases as expiry nears. Also, in general, volatile stocks have higher theta than non volatile stocks. Options writers write high theta options near expiry. When you expect a stock to be medium term bullish but short term neutral, you can check the theta and trade a Long Calendar Spread. That is short a high theta option near expiry and buy the option for the next expiry if it has a high theta. OTM options near expiry with low theta can make for a buy s long technicals suggest an uptrend, and vice versa. 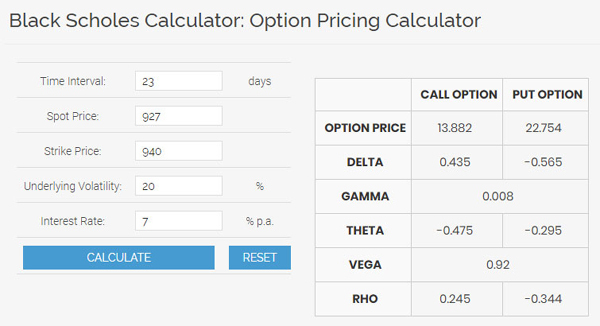 Vega measures the movement in Options Premium with every 1% move in Implied Volatility (IV). When Vega drops, it makes both calls and puts lose value. When Vega rises, it makes both calls and puts gain value. It’s a tough call to trade on Vega, but for professional Options Traders it makes sense to know how changes in Implied Volatility can impact their positions. Professional traders focus on Delta, Gamma and Theta. You can always use this guide to figure out volatility per stock. All options calculators factor in a safe rate of interest, which is the interest rate generally paid on Government Treasury Bonds. Currently the safe rate is hovering between 7.7% and 7.9%. Though rates are generally stable and moving 1% either way is a Herculean task, even a small change can impact premiums. We’re at 5 June 2018 and tomorrow is the day of the RBI policy. There’s a hike in interest rates expected and that could impact options premiums. Generally, when interest rates are stable, Rho does not impact premiums. When interest rates rise, Call options premium increase and Put Options premium decrease. So, Calls have Positive Rho and Puts Rho is negative. Now. having understood the Greeks, please use this calculator and enter into paper trades and I’ sure you will discover a strategy that fits your trading style. 1 Comment on "The Facts About Options Greeks"
thanks your articles are very helpful, please make article on which strategy apply on different kind of stocks. we will appreciate your effort.